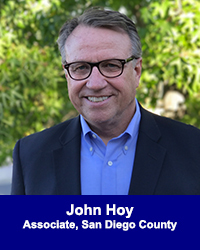 John Hoy, Associate- San Diego County - California Consulting, INC.
California Consulting is pleased to welcome John Hoy as our newest Associate-San Diego County. John Hoy has a national reputation for running successful, high profile public affairs campaigns. Hoy specializes in strategic and tactical planning for corporations, trade associations and non-profit organizations. He has also directed innovative public affairs campaigns for private-sector clients. Hoy’s successful management of many of the most prominent recent campaigns in the area has resulted in very strong ties to San Diego County’s elected officials and community leaders. Hoy worked closely with San Diego’s veteran community in directing the successful effort to preserve Miramar as a Marine Corps Air Station. In addition to his vast experience in nonpartisan races, Hoy held a number of senior political positions. Hoy, a native of Southern California, lives in San Diego with his family.